History of Traveling Shows In America Is Rich And Colorful! The final decade of the 19th century witnessed a procession of giant fairs, which, in turn, promoted dozens of state-wide events and hundreds of county and city fairs, each one copying some features of the huge world expositions. Chief among these expositions in America was the 1893 World Columbian Exposition in Chicago. 716,881 people attended the World’s Columbian Exposition for “Chicago Day,” October 9, 1893.This day commemorated the anniversary of the Great Chicago Fire of 1871. The World’s Columbian Exposition, celebrating the 400th anniversary of Christopher Columbus’s landing in America, was actually held in 1893, a year later than had been planned. New York City, Washington, D.C., St.Louis, and Chicago had all vied for the honor of housing the exposition, and it was during this vigorous and often vocal competition that Charles A. Dana, editor of the New York Sun, dubbed Chicago “that windy city.” Chicago’s lobbyists finally won out and, on April 25, 1890, President Benjamin Harrison signed the act that designated Chicago as the site of the exposition. It took three frantic years of preparation and work to produce the exposition. Although dedication ceremonies were held on October 21, 1892, the fairgrounds were not opened to the public until May 1, 1893. The exposition closed on October 30, 1893. This World’s Fair sold more than 25 million tickets and introduced the world to a nation not only conceived in liberty but convinced of its own greatness, and eager to try just about anything as long as it was new, electrical, and enormous, or simply bizarre. The Chicago World’s Fair tapped into imaginations both for the visitors and inventors. This imagination built t a new-classical colossus–an inspiration for an entirely new wave of beautiful architecture that would remake the American civic plaza. This imagination also brought the world’s first midway: a mile-long amusement corridor, attached at one end to the main fair site and at the other to a wide variety of emerging cultural experiences and curiosities. The exposition occupied 630 acres in Jackson Park and the Midway Plaisance. The main site was bounded by Stony Island Avenue on the west, 67th Street on the south, Lake Michigan on the east, and 56th Street on the north (see map). The Midway Plaisance, a narrow strip of land between 59th and 60th Streets, extends west from Stony Island to Cottage Grove Avenue. On the midway, Little Egypt danced her hootchie-kootchie–a dance that would soon arrive, in some derivative form, in nearly every small town in America. “Oddities” from around the globe, and villages of savage peoples amused the hordes of Midwesterners and served as a reminder of the advances of (white) civilization. 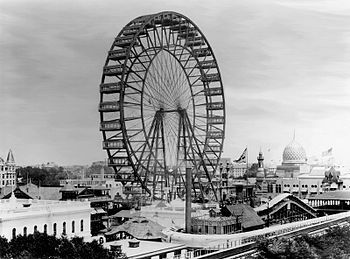 The imagination of inventors like George W. Ferris building his first great wheel, soaring 250 feet into the air. But perhaps the most popular attraction at the Exposition was novel uses of electricity. From the creation of the first moveable sidewalk to the first all-electric kitchen, electricity sparked a bonfire of imagination among fairgoers. Tom Edison and George Westinghouse competed to outdo each other in the creation of an entirely new world of light and mechanical wonder. In 1893 the Chicago’s World’s Columbian Exposition (also called the Chicago World’s Fair) was the catalyst for the development of the American Traveling Shows. At the Chicago World’s Fair was an avenue at the edge of the grounds called the Midway Plaisance. This avenue of the fair had rides, games of chance, freak shows, wild west shows including Buffalo Bill whose show was set up near the fairground and burlesque shows. The first Ferris wheel constructed by George Washington Gale Ferris, Jr who was an engineer and bridge builder. He had an idea and made a proposal to build a huge observation wheel, 250 feet across, supported by two towers 140 feet high, Attached to the wheel would be 36 cars, each able to carry 40 passengers so that 1,440 people could ride at one time. That was in October of 1892 and as they say, the rest is history. After the Chicago World’s Fair, traveling carnival companies began touring the United States bringing the entertainment to the people of America. The financial success of the midway at the Chicago World’s Fair led to a proliferation of smaller traveling carnival companies in the ensuing years that continued to use the name “midway” to refer to their entertainment offerings. The term “midway” was adopted from the Midway Plaisance to denote the area at county and state fairs where sideshow entertainment was located. Most of these early carnivals did not survive for long, as their dependence on guaranteed crowds and money was significantly challenged by the sparse population outside urban centers in North America. Many of the smaller carnival groups joined together, thereby creating a single carnival company, which made them far more attractive to the general public and guaranteed them more bookings over the carnival season. Otto Schmitt, who was a showman at the world’s fair, formed Chicago Midway Plaisance Amusement Company. The company featured thirteen acts, including some from the World’s Fair, and began a tour of the northeast United States. His company closed due to poor business practices before completing its first tour. Some members of his company formed their own successful traveling carnivals after Otto Schmitt’s company closed. The appeal of this new type of entertainment was embraced. In 1902 there were seventeen traveling shows in the United States. The number grew to forty-six in 1905 and by 1937 there was an estimated 300 traveling shows touring the country. One such show, The “IT Shows” set up yearly on probably every empty sandlot in NY’s Brooklyn, Queens, and the surrounding area. One of the first spinoffs from the Chicago and other great expositions was the establishment of permanent state fairgrounds and annual fairs as a normal operation of state government. And no state fair worth its salt would deny the midway its place on the grounds. In fact, the size of the midway, more than any other feature, became a boasting point for the state fairs. The mushrooming of state and county fairs opened a wide door for thousands of new carnival entertainers, from comedians to death-defying high-divers. The surviving medicine shows attached themselves to these events as well when they could, and small traveling circuses added midway entertainments as sideshows to capture more of the crowd’s cash. In the cities, the beginnings of vaudeville formed from the ranks of circus, medicine, minstrel, and carnival performers. By the end of 1900’s, there were 67 theaters in the United States devoted to vaudeville, and two in the works in London. The population of the United States had nearly doubled in twenty years between 1881 and 1901, and much of this new population headed to the cities and towns, where a new feature of the leisure industry was about to take off: permanent commercial amusement sites. Traveling medicine shows were now in full decline, in part because of new state regulations on the contents and distribution of patent medicines. In their place, carnival operators moved in to bring entertainment to annual holiday celebrations, fairs, and tournaments in small towns. The first documented traveling carnival, the Canton (Ohio) Carnival Company, opened its first show in Chillicothe, Ohio, on May 30, 1899, and it heralded a continuing relationship between carnival commerce and social service clubs in America’s small towns. For the next century, Elks and Moose and Kiwanis clubs raised money for their local charities by sponsoring annual fairs and hiring traveling carnival organizations to bring amusements to vacant lots on the edges of almost every small town in the United States. However, there were also carnivals that arranged to play without local sponsorship, but rather with a donation to the local constabulary that allowed a sideshow to run without regulation. And here, the carnival might live up to its dangerous reputation. It’s outrageous entertainment, however, came straight from decades of grandiose American showmanship. By the turn of the century, Wild West shows had expanded their cowboy-and-Indian theatrics with displays of horse riders and “savages” from around the world. Famous battles from recent wars around the globe were reenacted as spectacular performances, and the military riders paraded out daily from the exhibition grounds to traverse the city’s streets. Meanwhile, the oddities and ethnographic others of the great expositions and circuses were also exhibited in more permanent “dime” museums. “Zip the Pinhead,” “Krao, the Missing Link,” Francisco Lentini, the “three-legged boy,” and hundreds of other freaks migrated between the traveling carnival circuits and appearances in these urban showcases. In New York, another product of the excesses of the Gilded Age was under construction: Coney Island. Through most of the history of the 19th century, rural North America enjoyed the entertainment of traveling shows. These shows could include a circus, vaudeville show, burlesque show or a magic lantern show. 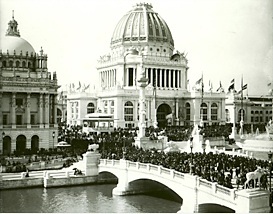 Through the 1893 Chicago World’s Fair a new form of entertainment was given to America. The American Traveling Shows early years went from town to town by horse and wagon. Later years would see the American Traveling Shows use of railroad cars. Modern traveling shows today mainly use tractor-trailer rigs playing both state and county fairs along with smaller venues such as church bazaars, volunteer fire department fundraisers and civic celebrations. A traveling show is an outdoor amusement show that may be made up of rides, food vendors, merchandise vendors, games of chance and skill, thrill acts, animal acts or sideshow curiosities. A traveling carnival is not set up at a permanent location, like an amusement park, but is moved from place to place.